It is with great sadness that we saw the recent chaos and criminality on our streets of London and other major cities around the UK. Our condolences go out to the families of those who have lost their lives during the turmoil. Several images and statements are enduring. The first is the helplessness of an overstretched Police Force to prevent the sudden escalation of criminal behaviour, the emergence of undercurrents of jealously, greed, violence and inter-community tensions. When Police authority was removed real emotions and motivations were released in a crude and raw expression. ‘You’re rich we’re poor but we rule the streets tonight’ was an expression of the crude, underlying feelings. In response many Londoners utilised social media for a good purpose to gather to clean the streets the next morning. There have been many noble but unsuccessful efforts to assist the most vulnerable and deprived of UK society. It would be wrong to blame these riots upon these failures. We should instead recognise that there is a widespread failure to inculcate correct values that would strengthen the conscience of individuals. Irrespective of the opportunity to steal or loot individuals should not take the chance but respect other’s property. Similarly Directors of companies should not abuse their position to exploit others. Politicians should not abuse their positions and power. Journalists, and religious leaders, also should not abuse their position. The Universal Peace Federaton believes we should live for the sake of others in creating one family of humankind under an inclusive, loving God and that we are morally accountable for our actions. These values should be taught primarily by example in the family, but also in schools, religious institutions and the wider community. It is with great regret that we heard the news that the Christian Minister, Terry Jones burned a Koran in a public ‘trial’ in Gainsville, Florida. We as people of different faiths urge respect for faith to be the benchmark of inter-religious and inter-community relations. Religion can be a powerful force to divide humanity. Centred on respect for faith in its many and varied forms religion can be a force for healing and unification that encapsulates and articulates the great love of our Creator. Please leave a comment if you wish your name to be added to this statement. Our first thoughts and prayers are for those remembering loved ones and friends lost or injured in the 7 July 2005 London bombings. This was the worst act of domestic terrorism Britain has ever experienced. The shock of finding that the perpetrators were young apparently well integrated British Muslims has caused many to question the role of Muslims in the UK. The July 7 bombings affected British Muslims in an unprecedented way as questions about their loyalty, Britishness and the nature of their belonging in our society created endless discussion, academic research, government interventions and media speculation. Today we add substance and authenticity to the debate. For the first time, 25 British Muslims explain in their own words what they were doing that day, how they were affected immediately by the bombings, and what lessons they draw now that five years have passed. The contributors, evenly balanced between men and women, include British born Muslims, immigrants and converts to Islam. 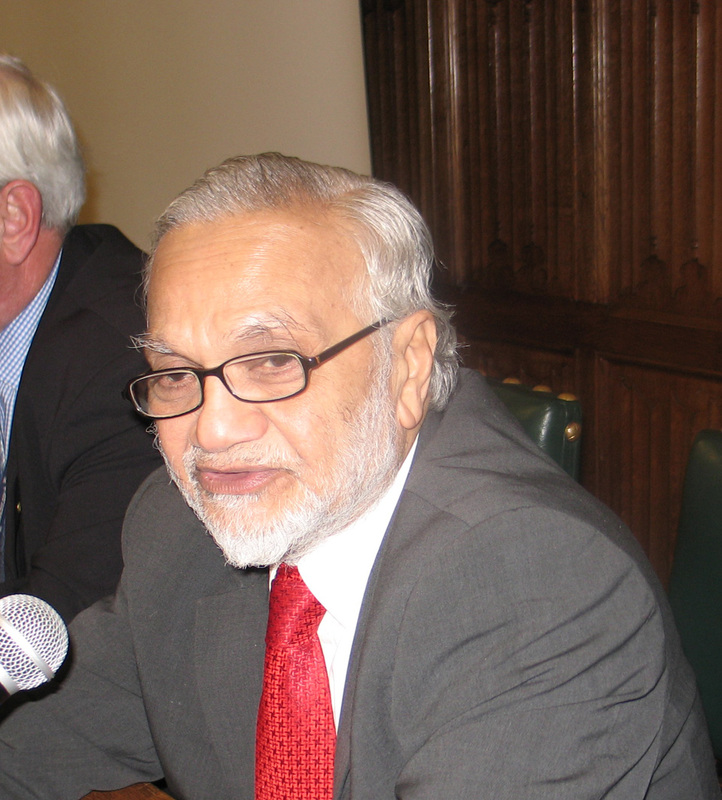 Edited by Murtaza Shibli, former Public Affairs and Media Officer of the Muslim Council of Britain (MCB), the book, 7/7: Muslim Perspectives will be launched on 7 July at the House of Lords, at an event supported by the Universal Peace Federation and European Muslim Research Centre, University of Exeter. 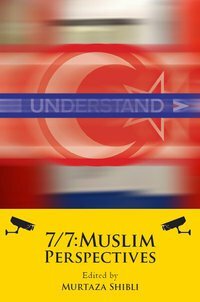 Robert Lambert and Jonathan Githens-Mazer of the European Muslim Research Centre, University of Exeter, argue that a failure to hold a public inquiry into 7/7 has led to many misunderstandings about its causes. This in turn has allowed religiously observant and politically active Muslims to be demonised as ‘radical’ or ‘extremist’ by ill-informed commentators and politicians. For them “This is an excellent book that challenges Islamophobic accounts of Muslims that have grown alarmingly since 7/7”. and women. Through the humanity and compassion in their testimonies a wider common ground can be perceived by concerned non-Muslim Britons. This is particularly necessary at this time of tension over immigration and the rise of the BNP”. 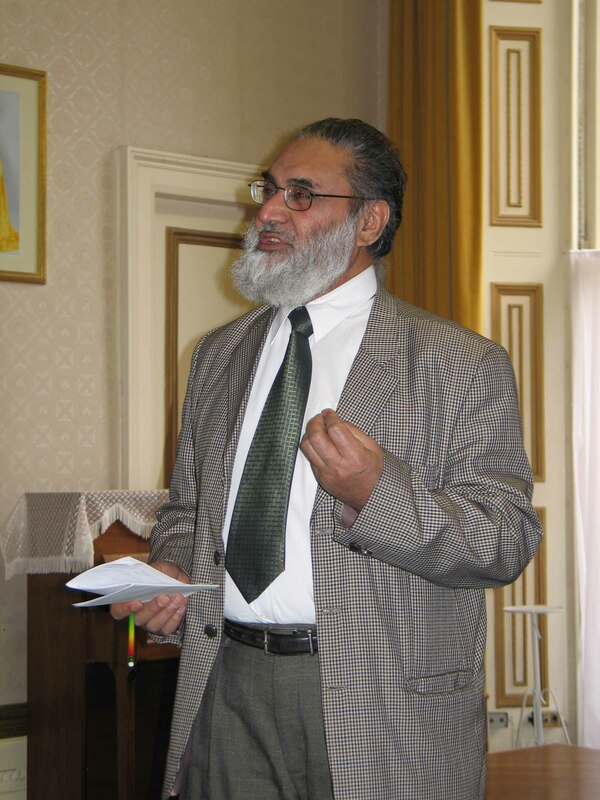 Mr Ghazanfer Ali is one of the founding members and present Chairman of Ilford Islamic Centre, previously known as the Muslim Welfare Association, that was established in the late 60’s. It was the very first Islamic organisation in the borough of Redbridge. The aims and objectives from the outset were to establish a centre which would fulfil the spiritual, religious, social and welfare needs of the local community. 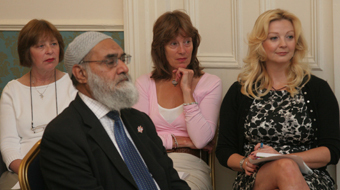 The vision was to create an organisation which would reflect the true essence of Islam – a belief based on the tenants of Peace, Harmony, Respect, Care, Tolerance, Community Cohesion, the development of relationships with other faiths and communities and the basic Love of Humanity. Starting from very humble beginnings, the Centre has now developed into one of the largest such organisations in East London and Essex. 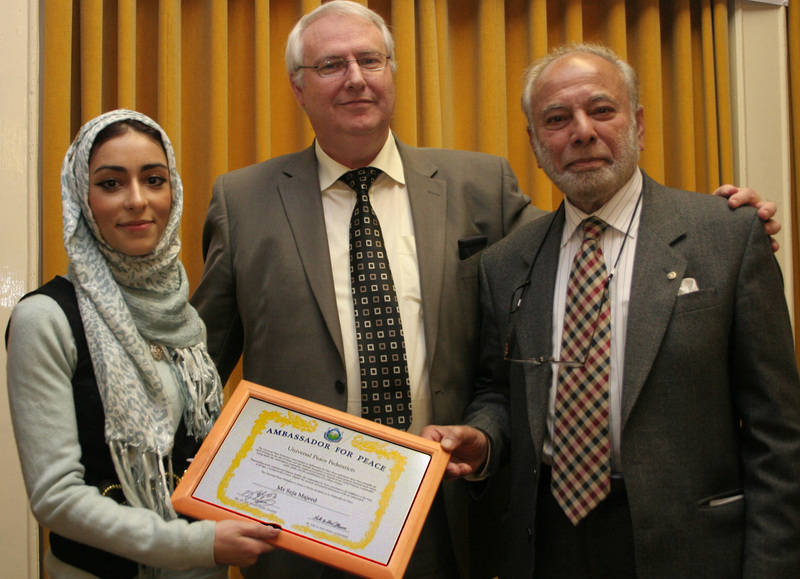 It is well known for it’s Community, Interfaith and Three Faiths Forum activities. It serves as a focal point for most Islamic activities within the borough for Muslims and non Muslims. We have numerous visits from a variety of organisations on a regular basis. Most schools in Redbridge send their children to the Centre for visitations and we have had visits from many foreign delegations. 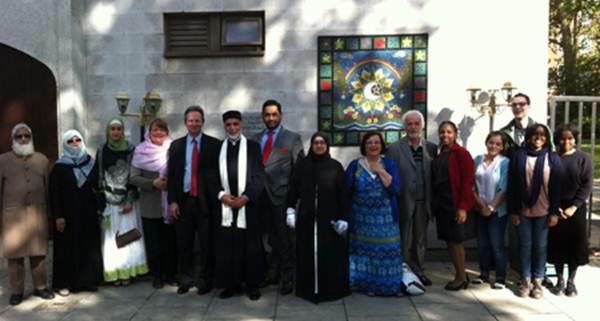 Only last week, we held a very successful Inter Faith Walk. We had a workshop at our centre organised by the Charity Commission, themed ‘Good Governance’ and two local primary school visits! 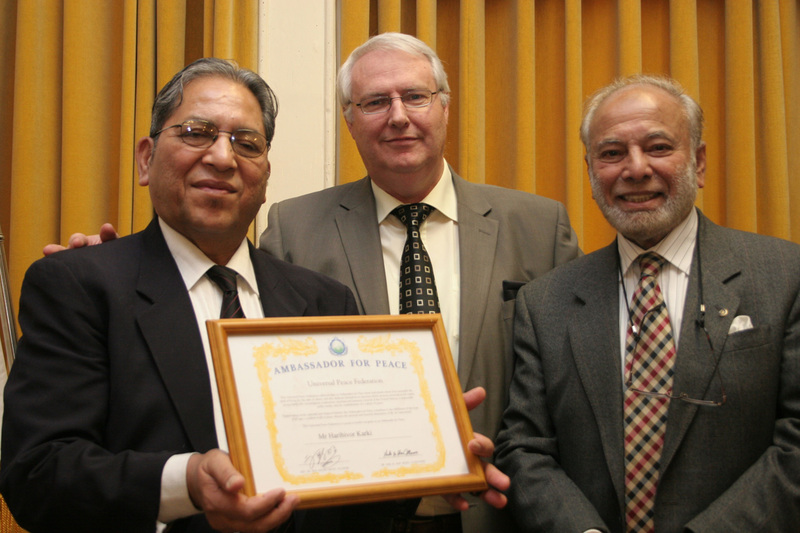 Mr Ghazanfer Ali has also been involved in many other community initiatives, most notably as Chairman of the Redbridge Racial Equality Council. 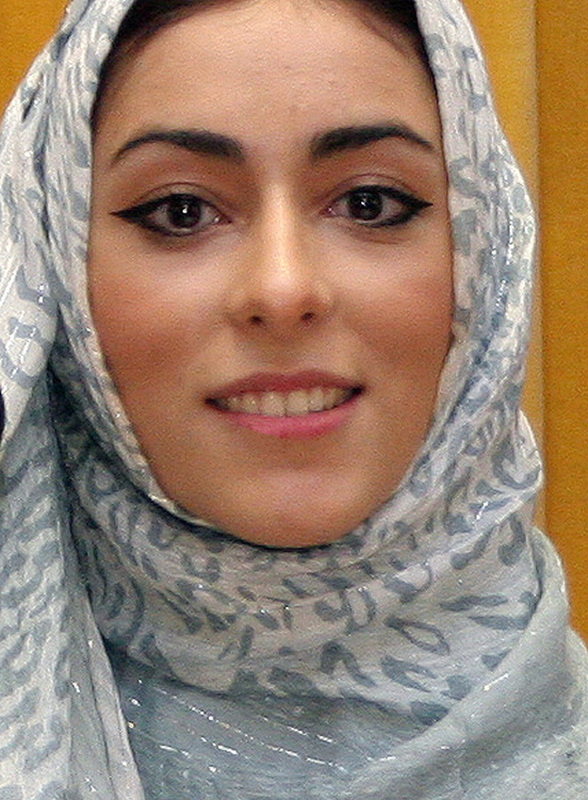 Seja Majeed is a twenty-three year old British Iraqi living in North London. She is a Law graduate from Brunel University and also has a diploma in screenwriting from the London Academy of Radio, Film and TV. She is currently undertaking her Legal Practice Course and Masters in International Law at City University. 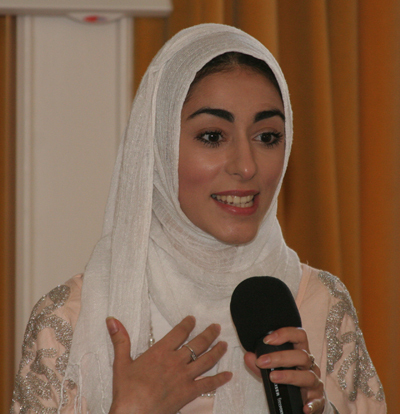 In 2007, Seja collaborated with the Rainbow Collective Film Company and journeyed to Iraq with the intention to deliver humanitarian supplies and record her accounts. Over the four weeks of her trip, Seja visited dangerous provinces and gathered relaxed and informal interviews with those trying to lead a normal life in the aftermath of a war. The film, “Baghdad Holiday” is currently within postproduction and has attracted attention from prominent broadcasters, such as More4, Guardian Films and Al-Arabia Network. The film has also been praised and supported by T.V. 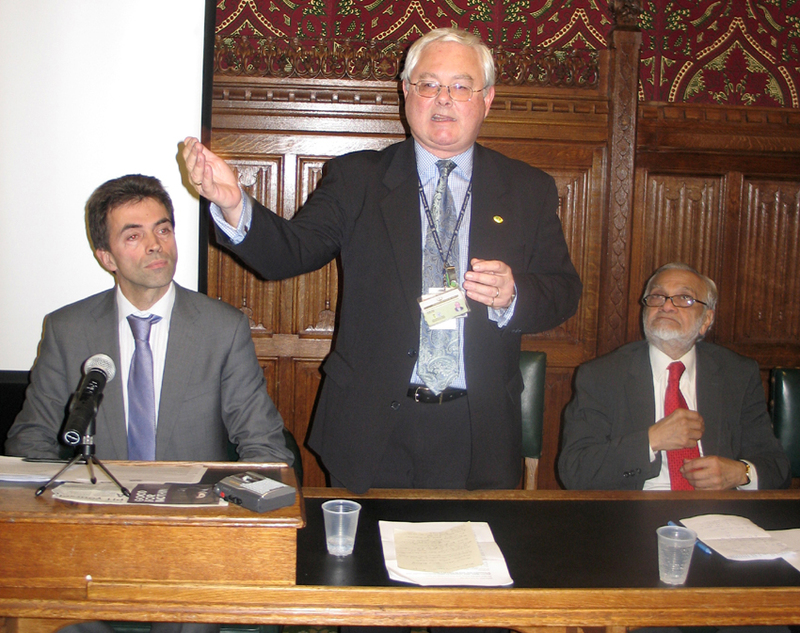 presenter Jon Snow, foreign affairs correspondent Jonathan Miller from Channel Four News, and the Secretary General of Amnesty International. It will be screened by Amnesty International in January 2010. 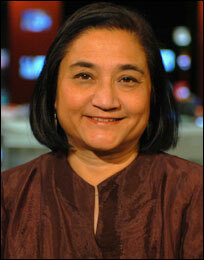 Seja also worked as an intern for Amnesty International in January 2009 on the Anti-Death Penalty programme, where she was based at the International Secretariat in London. She has recently won an award by V-inspired the National Volunteer’s Service, for being the most inspirational volunteer for Greater London. Seja is one of the first young Muslim women to be chosen in a national advertising campaign for V-inspired, the leading volunteer charity for young people. She ran make-up artist workshops taught by industry professionals to 16 -25 years olds interested in media or fashion through a Cosmetic Hive project she set up. 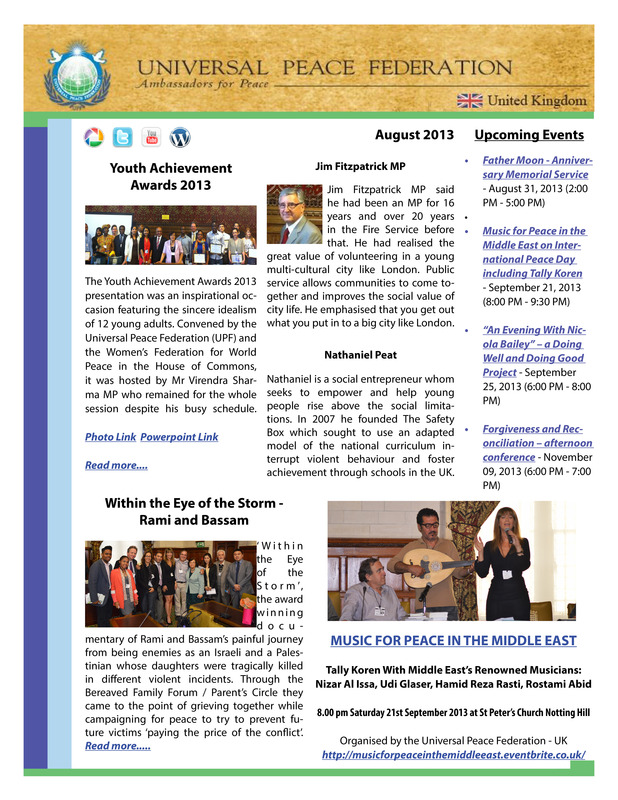 Seja has also been working alongside an Iraqi Minister of Parliament and has written social initiatives on his behalf. Her initiatives have been presented to the Iraqi Parliament for consideration. 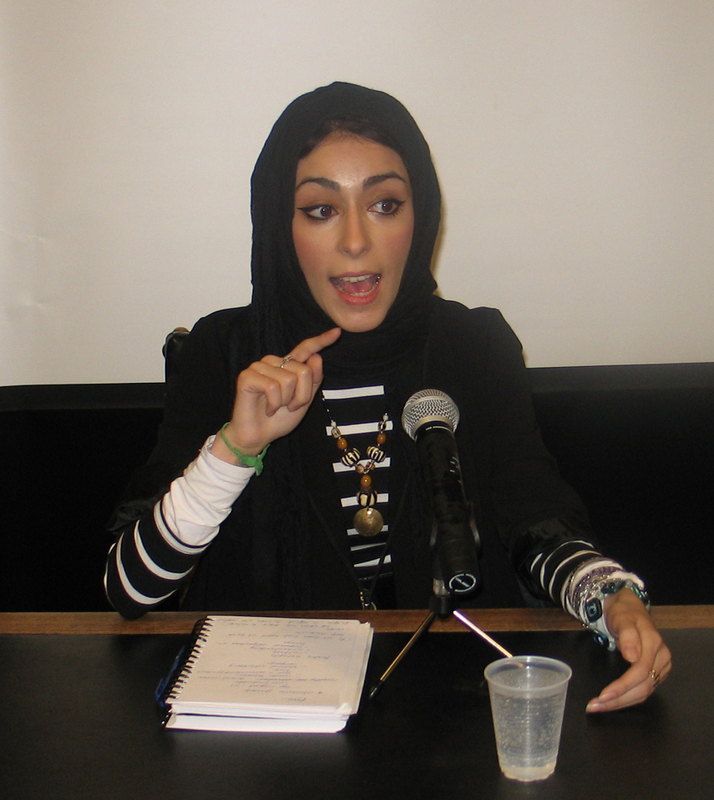 As an aspiring legal commentator she has recently had three of her articles published in the Journal of Islamic State Practices of International law. Dhinesh Golam has been very active over the last 15 years to support elderly people and those living with learning difficulties. He spent many hours in fundraising activities to ensure that those living with learning difficulties could have a holiday. He took those in his care to the seaside in his own time on weekends. He led a campaign to save the local Post Office that was used by many elderly people to save them the discomfort of a longer journey. He has also volunteered his time as a political activist. An inspirational idea put forward by one of our Ambassadors for Peace, Mayura Patel, brought together representatives from Islam (Ms Saleha Jaffer), Sikh (Mrs Rawinder Kalsi) and Hindu (Mr Ganesh Lall) faiths, Buddhism (Mr Les Kemp), Christianity (Rev. Elizabeth Jatto) and Unificationism (Mr Nigel Barrett) to expound on their respective major ‘Holy Days’ or celebrations through brief presentations which also introduced the basic religious tenets of each of the faiths. Whilst each of the very simple but profound explanations portrayed the unique historic and cultural underpinnings of their celebrations, it was striking how a deep truth became very apparent, namely the underlying human striving for goodness and higher ideals, culminating in the discovery of God, and his Holy Men/Prophets on earth, leading to the ultimate experience of inner and worldly peace. This ‘sameness’ was further highlighted through the stimulating panel discussion after the presentations. 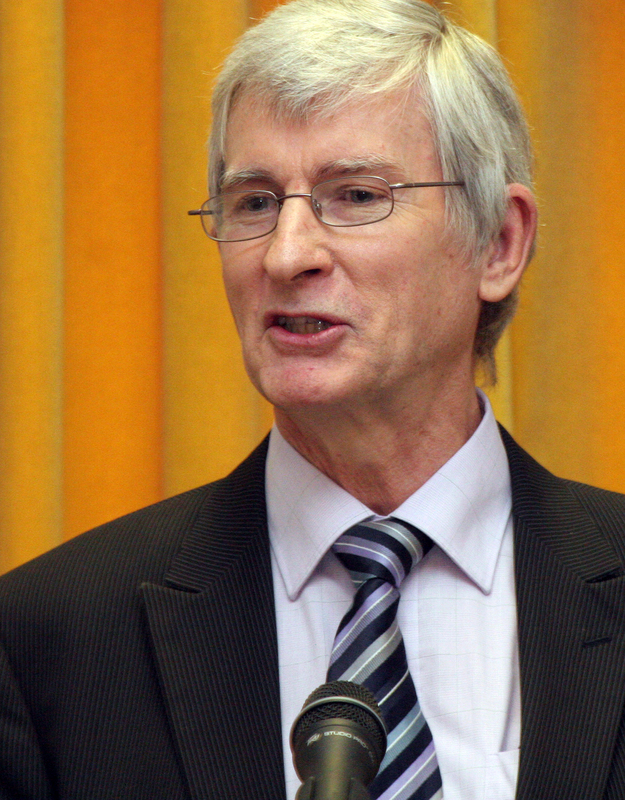 The conference was very ably chaired by Dr. Lance Gardiner. Mr Franklin Fortune showed a brief video about the recent 10.14 Marriage Rededication Blessing in Korea depicting the experiences of people from all over the world who were present at the event. This resonated beautifully with the existing mood among the participants. 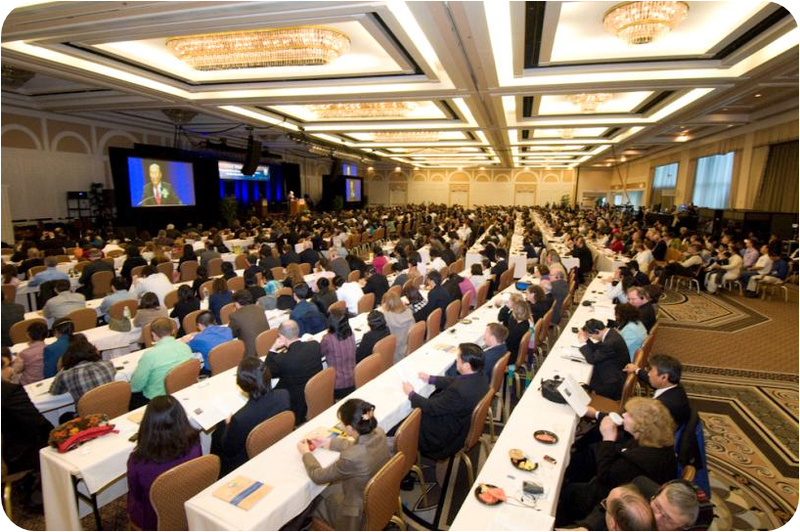 The conference was relatively small in scale but had a very intimate atmosphere. It was brought to a close by the traditional round of songs presented by Russell Gough as well as the usual buffet refreshments and networking among all. 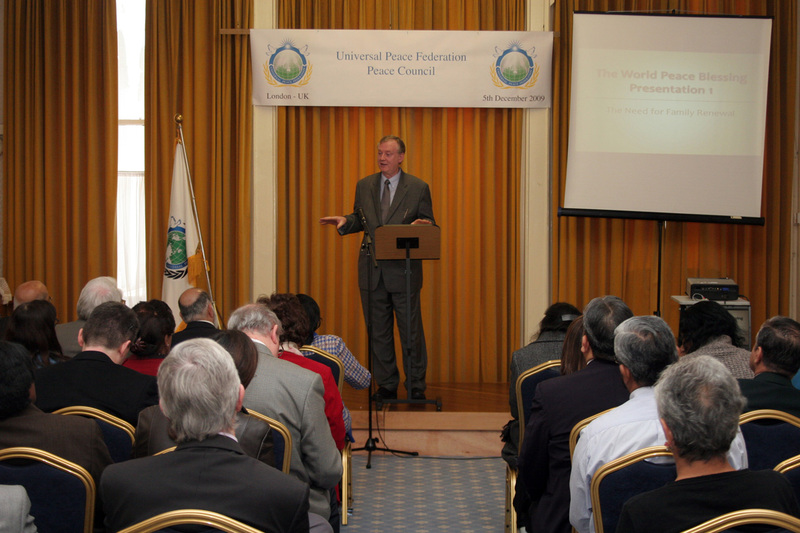 The conference was attended by about 40 Ambassadors for Peace, UPF supporters and their guests. The series has focussed on the need for a positive vision to address the challenges we face in this era of economic, political, environmental and moral crisis. The proceedings opened with a thought-provoking presentation by Mr Nigel Barrett on the role of conscience in personal development. Drawing on the philosopher Plato’s discussion of the mythical “Ring of Gyges”, he asked if we would still live a moral life if we could be freed from being held accountable for our actions by others – a pertinent question in light of the recent scandalous revelations of political and financial improprieties. He introduced the challenging concept of a cosmic level of conscience inspired by Divine spiritual laws and principles. Susan Beresford then presented the ongoing work of Undercroydon, a non-profit organisation, which has successfully brought communities together through innovative artistic, fashion and food-based projects. She described how projects such as the art mural in the Whitgift Centre in Croydon, in which several schools participated, have released individuals’ creative and cooperative talents. A lively panel Q&A session followed the speaker presentations, and the proceedings concluded with the generous donation of a large cheque by the Sabrang Ladies Group to UPF for improvement of the furnishings in the Peace Embassy. For more photos please use this link. 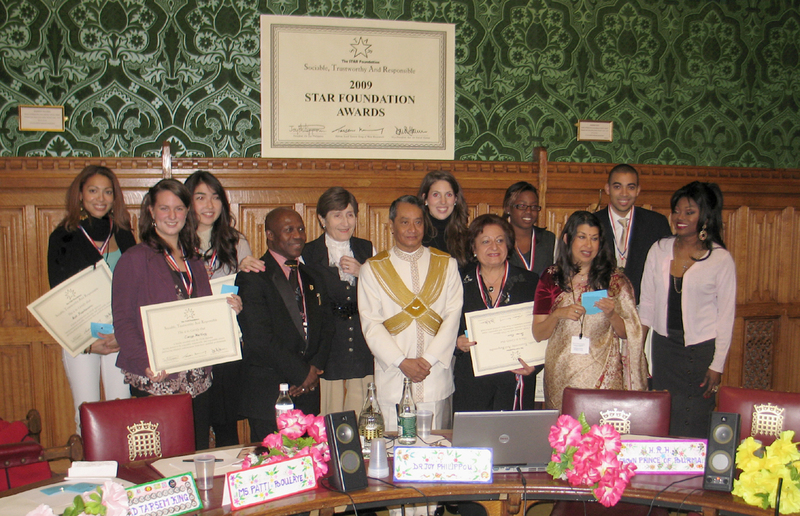 The Star Foundation Awards were presented to young people nominated for doing good work in their community or for keeping the slate clean for several years if they were in trouble in the past. I nominated a young lady, Narraser Gordon, from Bristol who has led a campaign in Bristol to STOP (Solve This Ongoing Problem) gun and knife violence. 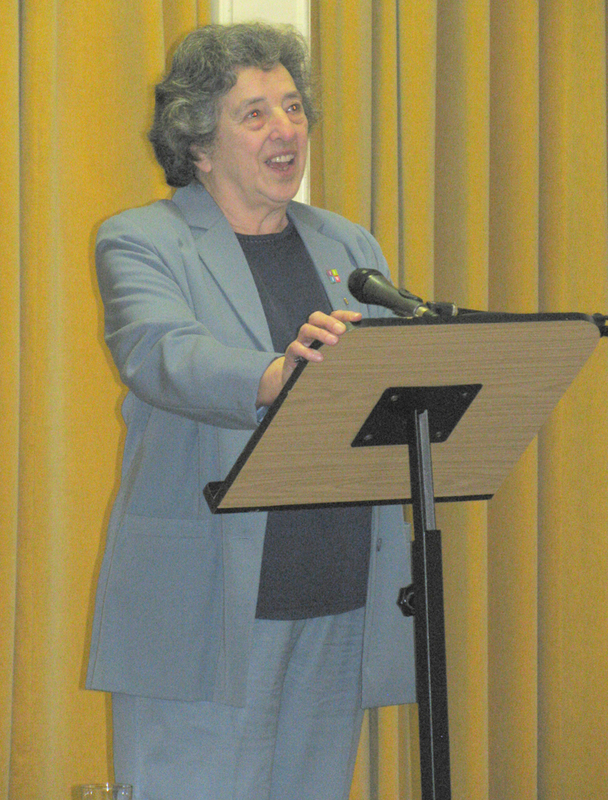 She gave a talk at a recent Bristol Universal Peace Federation event I attended about the work of STOP. Narraser, blessed with a strong Christian faith, has a sincere passion to prevent the violence among her peers that has killed too many already. She takes each death, each injury, personally. 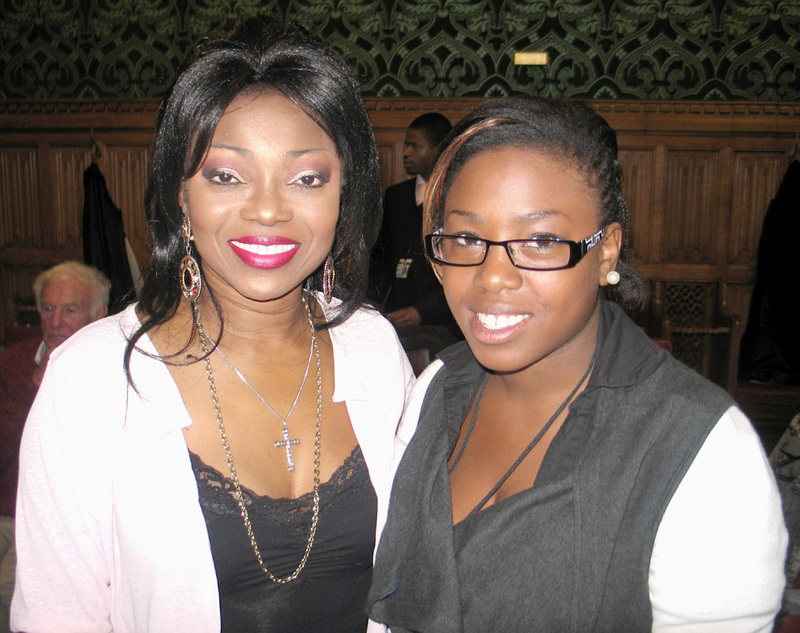 Patti Boulaye, who has several charitable projects of her own, was very encouraging to all those receiving awards. She emphasised the need for good family traditions and boundaries that form the bedrock of a good society. We have a wonderful opportunity to celebrate National Interfaith Week and to commemorate the late Dr L.M. Singhvi’s contribution to interfaith work. Dr Singhvi, as a distinguished seven year Indian High Commissioner to the UK, left a deep impression particularly in his encouragement of good interfaith relations. 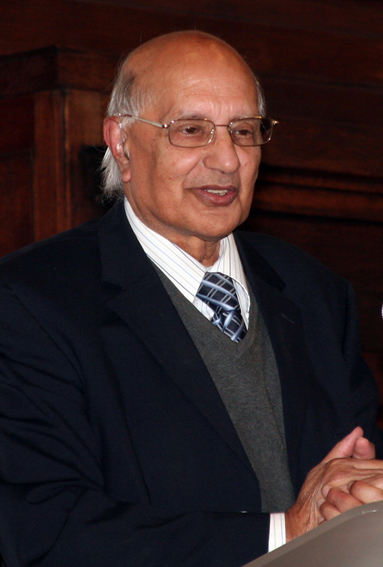 Professor Lord Parekh, who in November 2008 gave a commemorative lecture, will highlight the significance of Dr. L. M. Singhvi’s promotion of interfaith understanding in the cause of peace. 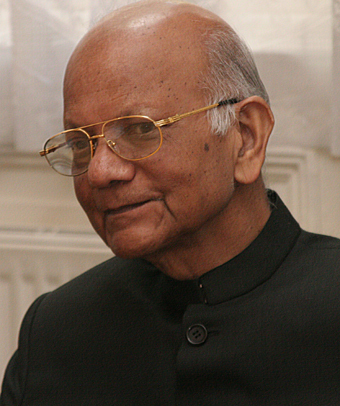 Dr Singhvi was the former President of the Universal Peace Federation (UPF) in India and in that position held numerous conferences on the possibilities of an Inter-religious Council in the United Nations. The UPF Interfaith Committee’s series of Joint Celebrations of Holy Days seeks to provide opportunities for people of faith to learn about and celebrate other religious traditions. We are encouraging an inter-generational expression of younger and older representatives of Muslim, Jewish, Dharmic and Christian faiths to explain what Eid, the Jewish High Holidays, Diwali and All Saints Day means to them. We want to encourage younger participants from the audience to also offer their comments during the evening. 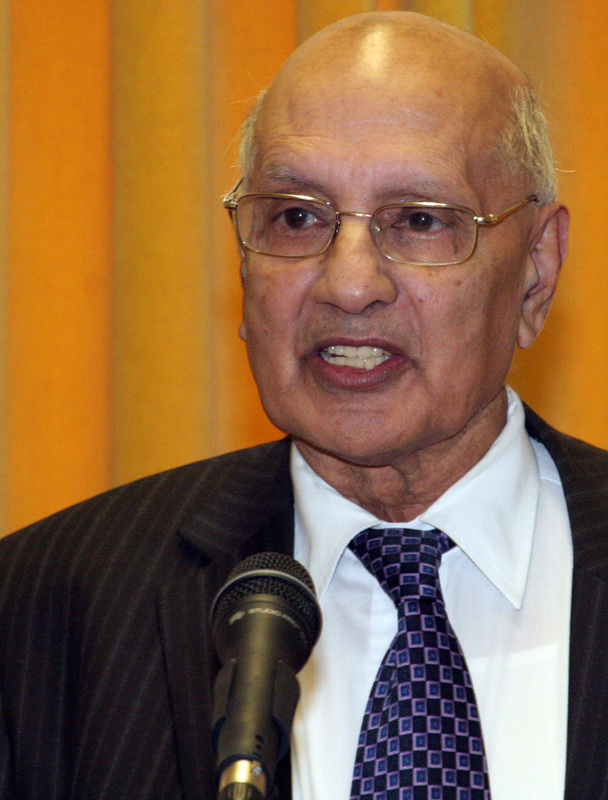 It is appropriate that we can celebrate the holy days of several faiths while commemorating the contribution of Dr Singhvi who contributed greatly to interfaith dialogue. ‘Today religion is often seen as a potent but negative force. As Lord Parekh said, we must not just look for commonalities between religions but for ways in which we can aid the process of co-existing well. In the declaration of UNESCO it states that ‘War begins in the minds of men’ – I say that peace begins in the minds of men, women and children. 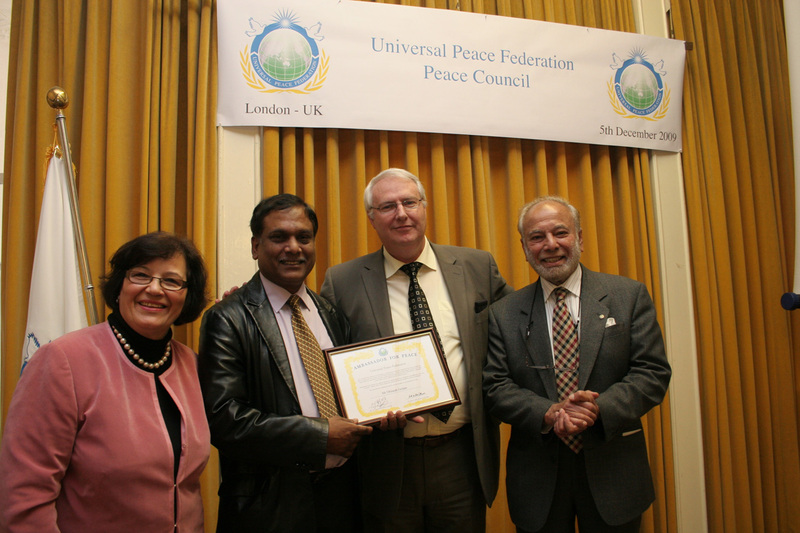 The Universal Peace Federation’s work is all about this peace and it is my privilege to introduce this work to you. UPF is emphasizing that peace is too important to be left to diplomats and soldiers alone. There are other constituencies of peace which deal with our common future and human equality. UPF Bristol recently held a showcase event where we could welcome our European sub-regional chair Jack Corley and our UK secretary-general Robin Marsh. We also had presence of David and Patricia Earle from UK Birmingham region supporting us warmly. Among many guests, five new Ambassadors for Peace were introduced. 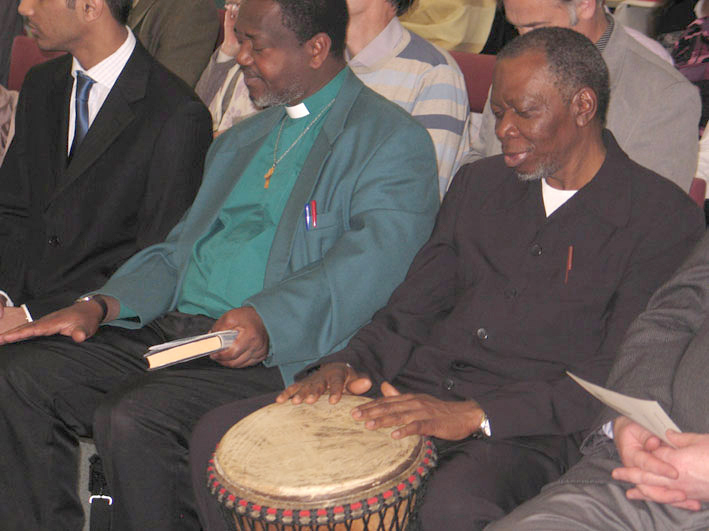 We had wonderful talks and lectures but also interfaith prayers, songs, African drumming and testimonies from our dear Ambassadors for Peace. Professor Iwugo from Bristol University who is an adviser for Bristol UPF said that ‘the UPF is a very inspiring organization where all the races and all the religions can work together for world peace’. UPF Bristol 2009 Talks and Song from Steve_and_Tomoko on Vimeo. This showcase made people much more aware and respectful of Father and Mother Moon’s work. After the official meeting finished, people were still talking with much excitement, feeling that they want to do something together with UPF. 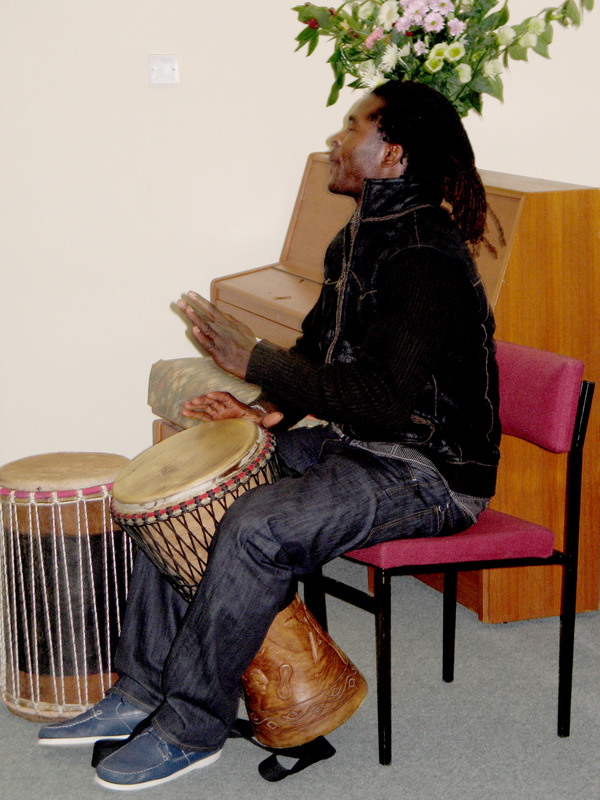 The audience enjoyed learning how to play African Drums by Omanye African Drums and Dance UK Performance. UPF Showcase Bristol 2009 from Steve_and_Tomoko on Vimeo. 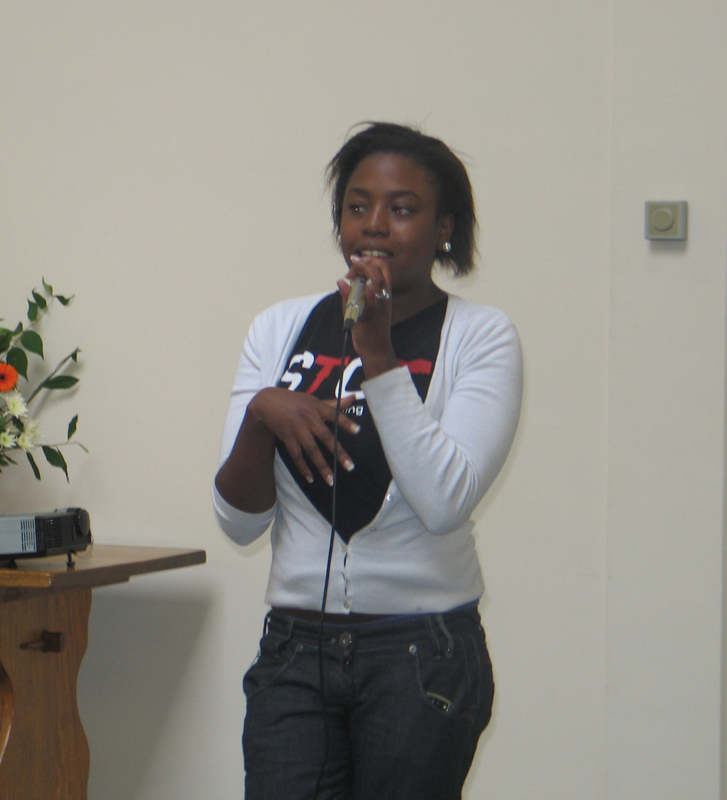 Danielle, 14 years old, sang beautifully during the programme. There was a very serious talk by Narraser Rochelle Gordon who is involved in STOP – Solve This Ongoing Problem – of gun and knife crime. More can be found about this organisation on Facebook. UPF Showcase 2009 from Steve_and_Tomoko on Vimeo. 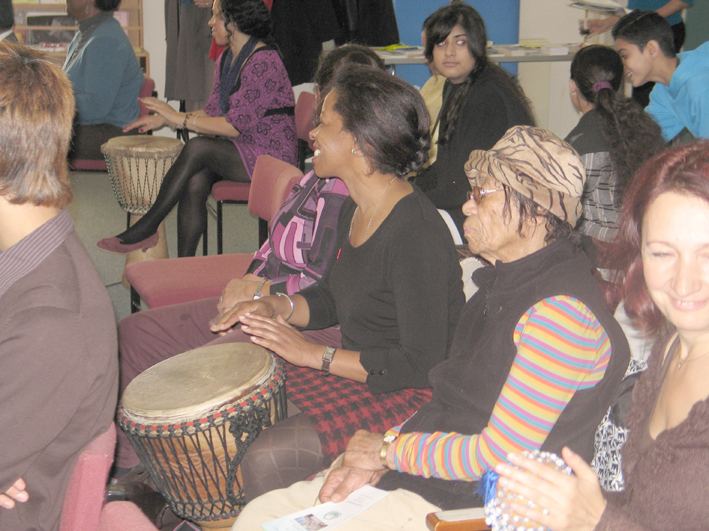 Dr Krishna (on right playing the drum) gave a wonderful testimony of going to an international UPF conference in Korea. The morning session was rich with experience and knowledge about the topic of Forgiveness as expressed by the pool of wisdom emanating from distinguished speakers such as depicted above as well as Dr Ven Sumana Siri, Mr Jehangir Sarosh, Andrea Foulkes and Mr Jack Corley of UPF who gave concluding remarks. The general feeling about the morning conference was well expressed by the chair Dr Braybrooke who felt that during next year we should consider a one day conference with 3 sessions, one which could be a workshop in smaller groups perhaps, given the fact that there was so much to discuss, and such a wealth of experience amongst the speakers. Today I had the opportunity to take part in a ceremony at Friends meeting house where representatives of many different faiths came together to share the teachings, practices and experiences of forgiveness and reconciliation. It was a rare and wonderful sight to see so many different faiths being represented on one stage as each stood to share their viewpoint. The religious leaders included keynote speakers such as Dr Marcus Braybrooke: President World Congress of Faith and Rev Dr Sumana Siri: Buddhist Cardinal of Europe and many many more. 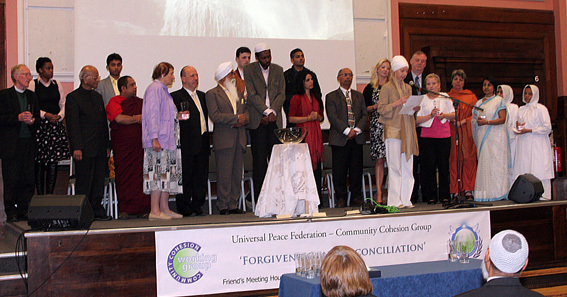 Differences are often emphasized between faiths and cultures, but by listening to the words of each of the leaders at the event today, one clear message was portrayed; forgiveness is a key aspect of a strong life of faith, which when practiced leads to peace within oneself, naturally allowing you to bring peace to others, as is described in Buddhist psychology, ‘He who loves himself will harm not another.’ Not only does forgiveness bring us closer to each other, but all faiths expressed that forgiveness brings us closer to God. One of names of God in the Qur’an is, ‘The Forgiver.’ In practicing forgiveness, do we not become God-like? One of the most important days of faith for Jewish believers, as described by Mr. Edwin Shuker: Sephardic Jewish Association, is ‘Yom Kippur ‘or ‘The day of Atonement’ where the relationship between God and humans is reconciled through repentance, and the seeking of forgiveness. To see the similarities in the teachings on the topic was interesting, but what I felt really created a positive atmosphere of unity in the hall, was the practice of forgiveness. Chants of forgiveness from the Muslim, Jewish and Jain traditions were presented, as well as an interactive session where the audience were asked to stand and greet their neighbor as a representative of all things that they need to forgive, and tell them, ‘You are forgiven!’ We were also led through a meditation chant by Mayura Patel representing Hinduism. At this point I felt that peace and reconciliation between people of different faiths cannot be achieved simply by an intellectual understanding, but to respect each other as much as to be willing to practice each other’s traditions. 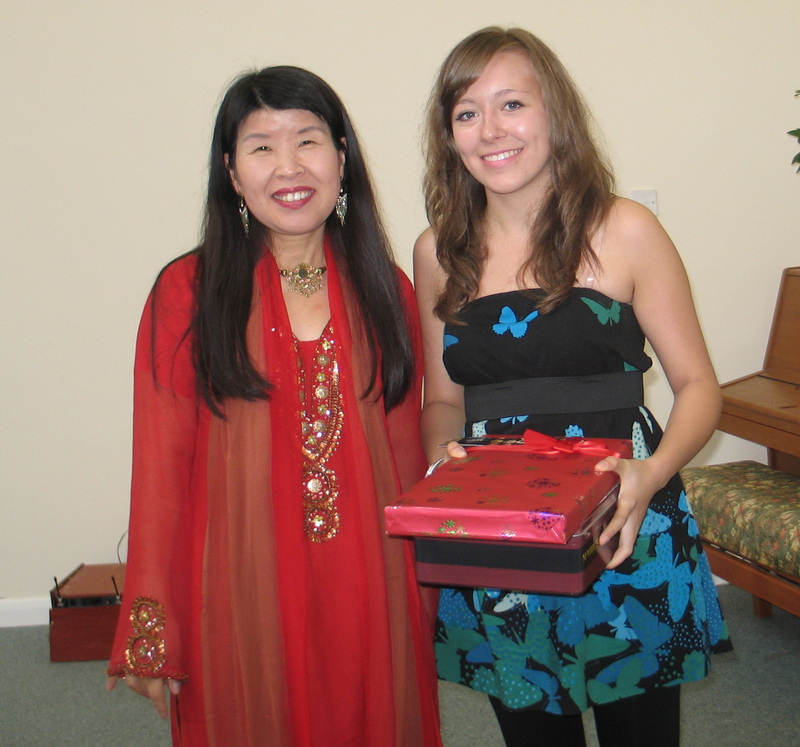 Everyone in the room was willing to share and participate in the practices of other faiths, and I was so moved! 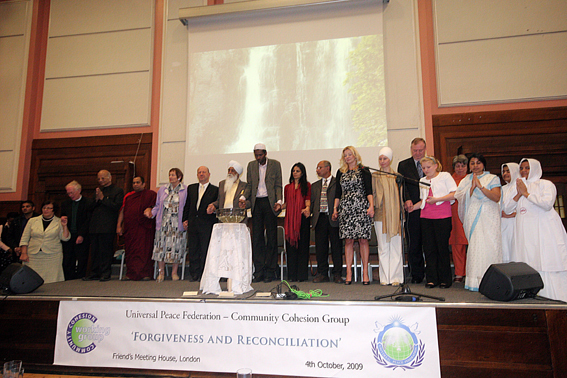 The highlight of the event was the ‘Interfaith Water Ceremony’ where representatives of each faith poured pure water into one single bowl, while reflecting on the virtues of water and its importance to Sikhs and Gurus, as described by Bhai Gurdas in his writing, ‘Be Compassionate Like Water.’ This ceremony is a symbol of the dissolution of resentments, and the desire to become one interreligious peaceful community. And after taking part in this event and seeing the example of the leaders today I feel inspired, and re-determined to practice forgiveness as one method to bring peace within myself, to those around me, and ultimately to God. Thank you! Dance of Forgiveness narrated by Ms. Anusha Subramanyam of Beeja Dancing Group Performed by Dancers Elena, Jecinta and Katrina. public-mindedness, is so essential for the good working of our political structures. The people of Britain once again have the opportunity to express their views about the future of Europe as well as some areas of local Government. It is important that all eligible citizens exercise their precious right and duty to vote, and that they vote wisely. Failing to fulfil that duty can only serve to assist those who wish to damage our democracy. is calling on all people of faith to pray for these European Elections that will be held on 4th June; prayer has the power to touch hearts and minds, and to nurture all that is good, loving and just. Of course, this commitment is one shared by all conscientious people. For this reason, UPF is making this call to all voters to reject divisiveness and messages of hatred and distrust, and to foster policies and decisions that further the wellbeing of all European citizens. Religion is the Only Way to Bring World Peace and to Bring People Closer Together But it is Usually Used as a Justification to Kill People. 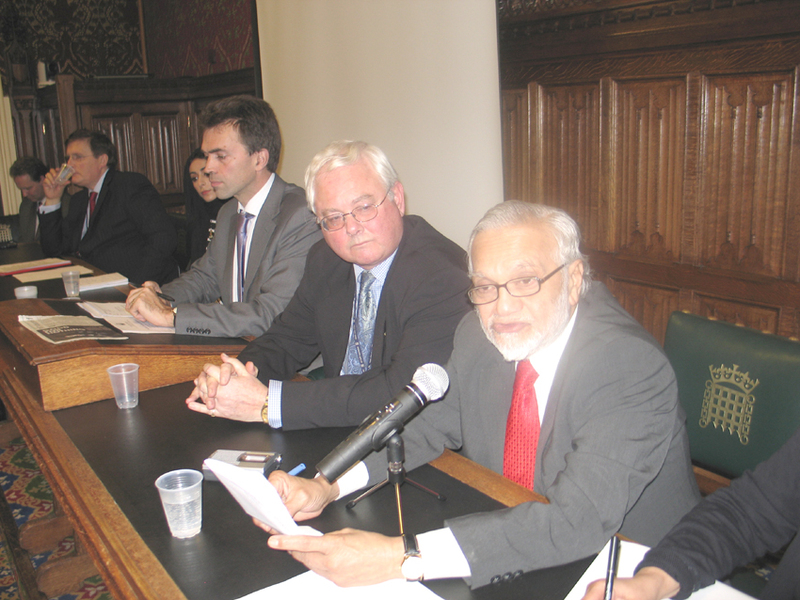 Dr Raheem Khan quoted that the Holy Prophet’s teaching includes bringing negotiations of peace with non-Muslims in every way. 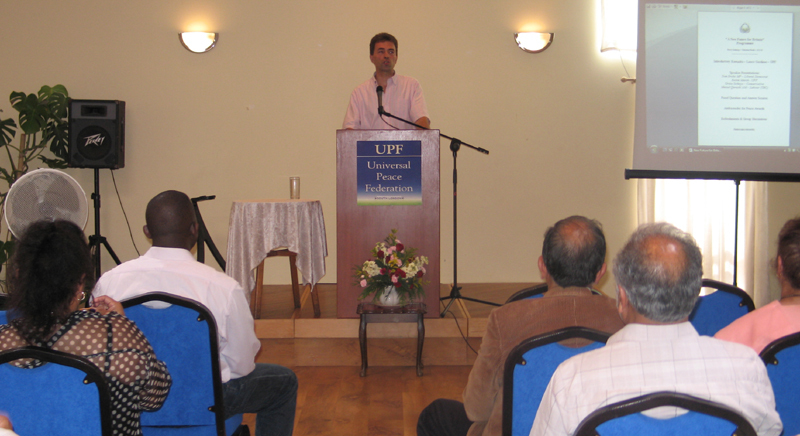 Under the auspices of the UPF, Muslims, Christians and Jewish leaders came together to address this meeting. They said practical steps are needed rather than just talk to bring inter-religious cooperation and understanding. Dr Raheem Khan said, over the past centuries people are being killed in the name of religion while religion is the only way that there can be peace in the world. 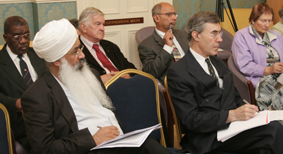 Interfaith dialogue is an important need of the day. Yael Lindenboim said the current circumstances of the world demand that mutual hatred should be replaced by mutual understanding between communities. There were recitals from different texts. The importance of each of the ceremonies was explained. 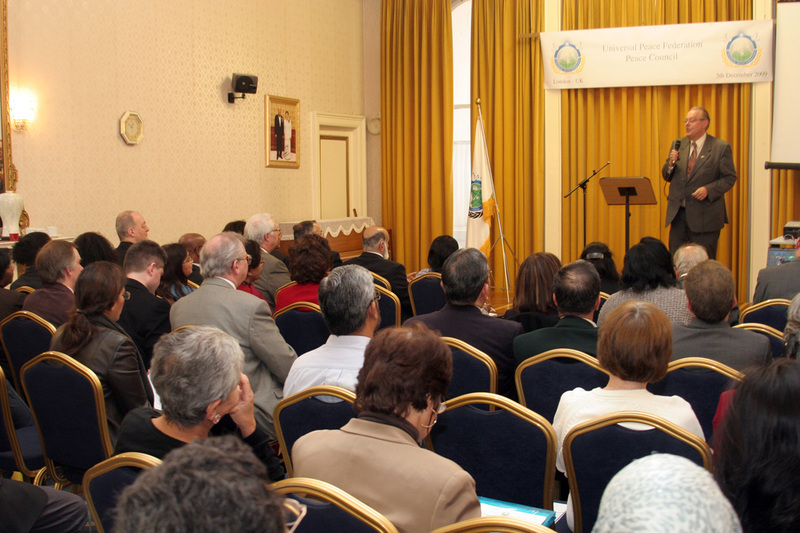 The occasion was attended by a large number of distinguished members of different faith communities. 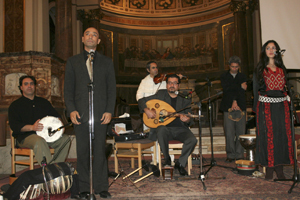 The Joint Celebration of the Holy Events of the Three Faiths was inspired by a very successful Jewish – Muslim Celebration evening on October 21st 2006 following the 2nd Lebanese war. Yael Lindenboim had suggested that event because the Jewish High Holy Days and Eid celebration at the end of Ramadan occurred at roughly the same time that year. Yael was acknowledged at the start of this evening by Dr Raheem Khan who had been one of the leading members of the Community Cohesion and Interfaith committees organising this event. The evening began with messages from those who had been aware of the evening but could not be there. 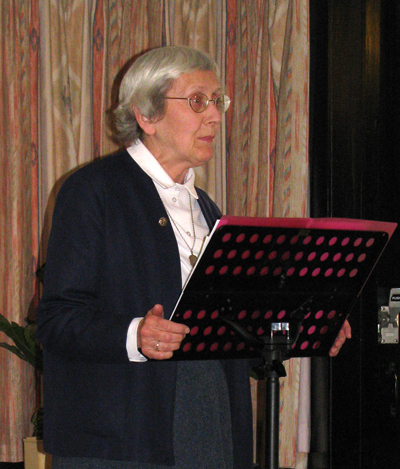 Canon Andrew White, the ‘Vicar of Baghdad’, had prepared a message that was presented by Sharon Booth his Personal Assistant and Project Manager of Foundation for the Relief and Reconciliation in the Middle East. The Rt. Rev’d. Riah Abu El-Assal, the former Bishop of Jerusalem, also sent a message that was read by Vanessa Edwards. Each of the three faiths representatives were to present scriptural readings about the holy event in their calendar and to explain both the significance and some of the traditions included in the celebration. There followed also some younger representatives presentations, cultural performances and food from each religious heritage. Pastor Dr Shadrach Ofosuware PhD FRSA, the Pastor of Freedom Centre International, a multicultural Christian Pentecostal church with an aim to “Raise overcomers and set the captives Free” explained that Easter was a time of renewal as Jesus came to renew humankind by bringing salvation through his sacrifice. Pastor Shadrach shared that Easter is the celebration of the Passover a time of atonement in which the High Priest makes a sacrifice of the Passover lamb for atonement of sins in the Holy of Holies. That shedding of blood atones for sins. Jesus shed his blood, like the Passover lamb, for our past, present and future sins. Therefore we can treat each other with love and care. Pastor Shadrach concluded ‘the blood of Jesus unites all nations and all people’. 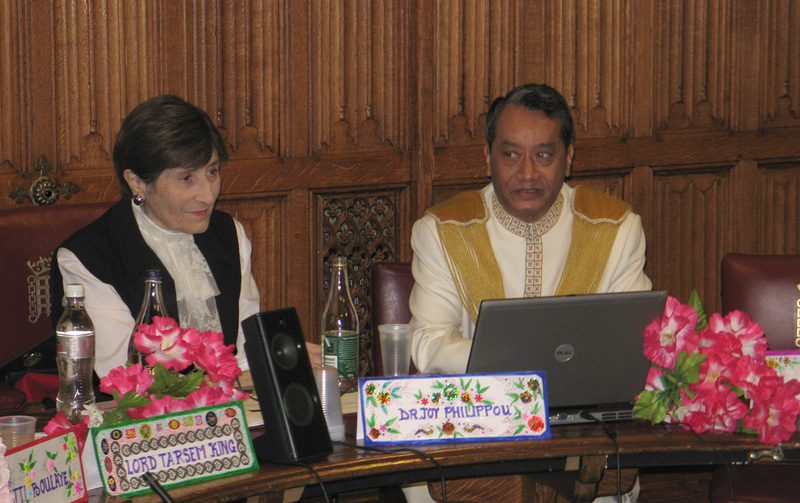 Imam Dr Abduljalil Sajid expressed how the birth and life of Prophet Mohammed (pbuh) influenced the world. Muslims in various parts of the world celebrate his birth as a perfect human being, in the festival of Mawlid An-Nabi, who came not to start a new faith but to continue the faiths of Judaism and Christianity. He pointed to the inclusive nature of the constitution of Medina as an example of his worldview. He did not create a constitution just for his followers but for all people of Medina, including those of other faiths, both for security and prosperity. His character of forgiveness was also exhibited in the conflict with the population of Mecca. During the persecution he did not want to condemn any of the persecutors so that they could have a chance to realise their mistake and come round to support him. After the victory over Mecca he was asked how he wanted to deal with the population of Mecca. He answered that he would deal with them in the same way that Joseph forgave his brothers for their wrong doing. This action led to an era of peace. 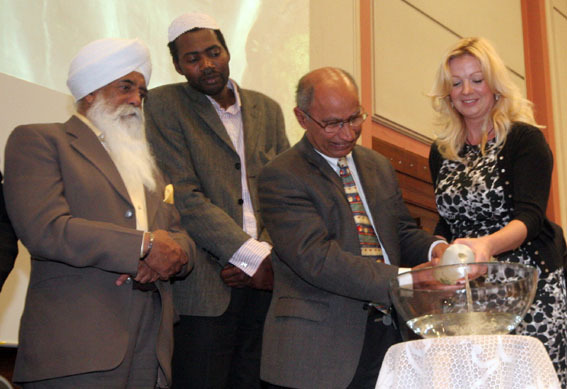 The ‘Joint Celebration of the Three Faiths’ included presentations, music and food from each faith. Because of the oncoming sundown Edwin Shuker, the Vice President of the World Sephardic Council, began the evening with a reading from the Torah and explained the reason for the traditional Passover foods. ‘Passover is a symbol of hope, he said, ‘it is my favourite holiday in the Jewish calendar’ he said. He explained some of the symbolism in Passover. He said that the removal of the leavened bread, ‘Hametz’, from the house prior to Passover, was an expression of removing the arrogance or pride. The Passover traditions are the longest rituals in the western world having been followed for 3300 years. 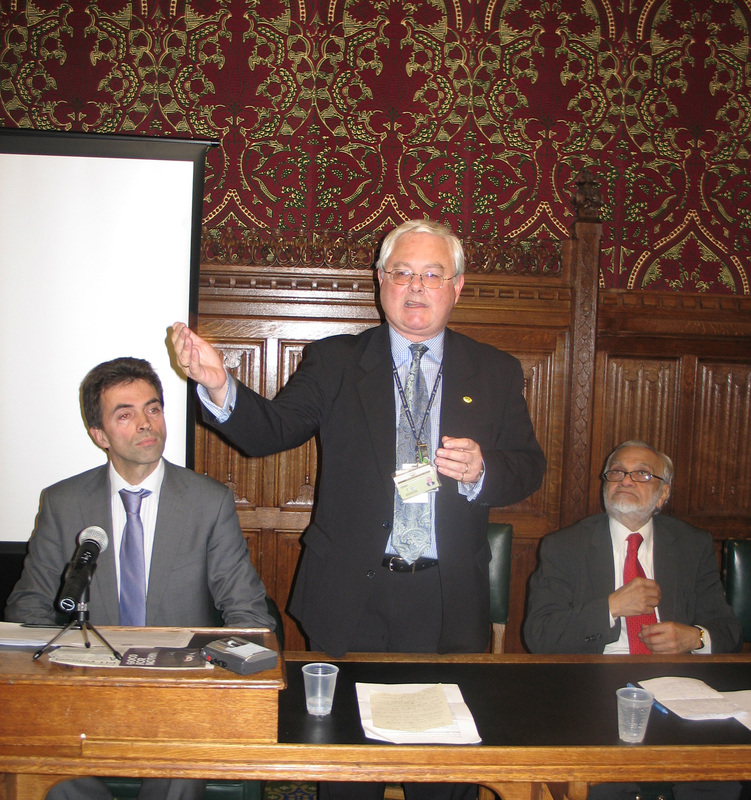 Edwin Shuker is also a member of the International Division of the Board of Deputies of British Jews and President of Justice for Jews of Arab Countries. Much as I desire to be with you and all taking part in the Three Faith Traditions Celebrations, I am afraid, physically speaking, it is not going to be possible. However, I want you to know that I will be with you all in the spirit. I have always advocated co-living not simply co-existence; believing that this will be the only way left for us, humans, to live in peace and harmony in years to come. Religion was never meant to separate people from people; irrespective of this or that person’s convictions. Neither was it meant to imprison any and make him/her a slave of this or that tradition. St. Paul was right when he challenged us to re-examine where we stand as believers when he said: “the letter kills but the spirit gives life.” We are called to bring life even in the midst of death. How more when we are called to live together, recognize the otherness that is in the other, if we wish the other to recognize the otherness that is in us. Religion has been used, misused and often abused, not by the outsiders, but those who claim to be the defenders of the faith!!! I am sick of that religion and I call on all who believe in the ONE GOD who created ALL of us to enjoy and appreciate the beautiful mosaic that the Almighty left for us humans to enjoy. To ignore the other and / or pretend he/she does not exist, does not make him/her cease to be. Easter reminds us of the love of God who cares for All His Children and want them to be united for what protects His beautiful image in each and everyone. It is the day when we celebrate the victory of life over death, the victory of faith over doubt, the victory of hope over despair. In the spirit of St. Francis of Assisi, I dare say it is in the recognition of the other that I am recognized; in appreciating the other and his otherness that I am appreciated and my otherness; and it is “in giving that we receive.” Easter is also the Passover, when we are called to pass–over barriers and reach out with whatever love God has placed in our hearts to meet the so-called ‘other.’ Only in passing we will realize that we have come to a Brother and to a Sister, not simply another creature. Oh for the day when God in His Mercy will break down all the barriers that separate the Brother in God from the Brother in God, the Sister in God from the Sister in God. This is the vision that St. John in the Book of Revelation saw and shared with us when the ‘new heaven and the new earth’ come in our midst and the Almighty be the God of All of us. Today you come together as members of the three great monotheistic faiths, Islam, Christianity and Judaism. Together we have one great thing in common we all believe that G-d is one. We all believe that G-d is part of our life and we believe interfaith activity does not make us weak in our faith it should makes us stronger and indeed more orthodox in what we believe and practice. Unlike many in the West I do not live and work with those who do not believe much. Most people believe firmly in their faith. Yet they are serious about engaging with the other. At the same time we all realise that when religion goes wrong it goes very wrong. We do not deny that religion is at the core of so many of the problems in the world today, but if religion is part of the problem it must also be part of the solution. The solution begins with you; you have come together as one not two or three. You must hear each other’s story and you will soon discover that you are friends not enemies. It was the American poet Longfellow who said “Who is my enemy; it is the person whose story I have not heard”. 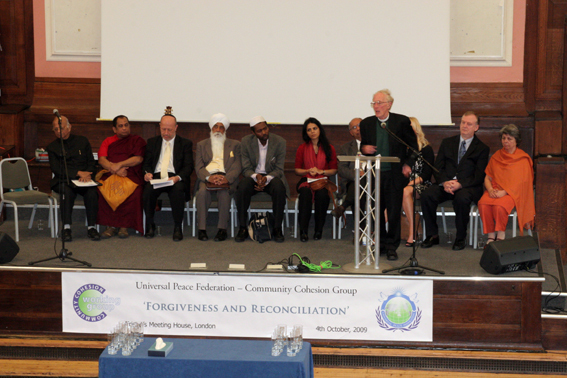 The UPF Community Cohesion & Interfaith Working Committees would like to invite you to a joint celebration of the holy events of the three faiths on Tuesday April 14th, at 6.30pm at 43 Lancaster Gate, London, W2 3NA. 1) MAWLID AN-NABI – The birth of the Prophet Mohammed, (peace be upon him) takes place on March 9th in 2009. Charity and food are distributed, and stories about the life of Muhammad are narrated with recitation of poetry by children. There are also large street processions and homes or mosques are decorated. 2) PESACH – The season of Passover when Jews commemorate the liberation of the Children of Israel who were led out of Egypt by Moses begins on April 9th and finishes on April 17th. This is commemorated each year at the ‘Passover Seder’. 3) EASTER commemorates the resurrection of Jesus Christ. It is the most important Christian festival. On Good Friday, Jesus Christ was executed by crucifixion. On Easter Sunday Jesus’ resurrection from the dead is celebrated. Easter is a time for families to worship and spend time together. As you well know these three Holy Days have a deep significance in the lives of the respective faith traditions and many who are less religious also hold these days as a special time in their yearly calendar – a time of togetherness in their families. As the 3 Holy Days are in close proximity, we are fortunate to have this opportunity to be together, to celebrate them all. Short talks about each festival delivered by prominent speakers from each Faith and illustrating the importance of the Holy Days to their faith community. The foods of the three faiths with particular significance for the celebrated holy events . 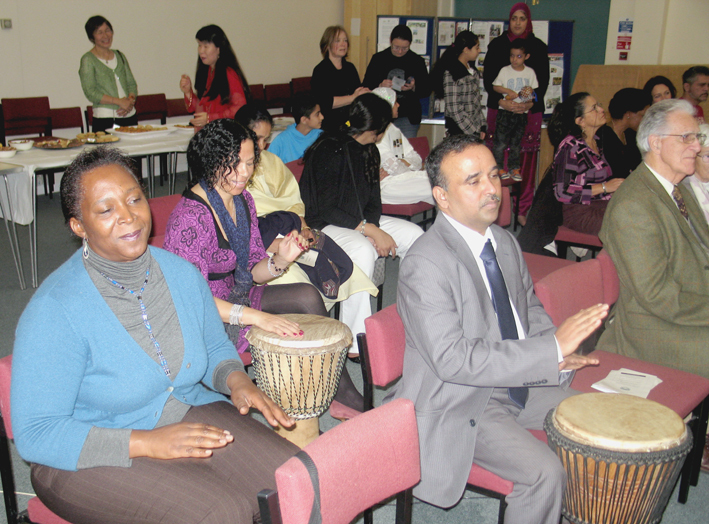 Music, Poetry and Cultural Performances from each faith community. More than anything we will have lovely people from all communities who want to share their Holy Day with others. We will learn from each other and enjoy a high spiritual experience, created by our collective good will. Peace, Harmony and Joy will reign! Should you wish to contribute (or someone you know) please let us know!! Habibah Anwar Bhatti: BME Development and Community Cohesion officer, Hastings V. A. In the absence of Shahid Malik MP, Lord King of West Bromwich stepped in to start the meeting and give the opening remarks. It was interesting for Lord King, being a person from West Bromwich, to speak about the importance of Community Cohesion in multi faith Birmingham. He also welcomed the former Lord Mayor of Birmingham Cllr. Mahmood Hussain, the respected Sikh leader, Mr. Bhai Sahib Bhai Mohinder Singh, and Cllr Idriss from Birmingham. Mr David Anderson MP was the next speaker who emphasised the importance of local communities, like the mining community he came from, for community building. He also emphasised the global aspect of Community Cohesion and he gave the example of how we could work together in Britain to improve things in Iraq. Iraq is an area where he is keenly interested in promoting better understanding between our two countries. 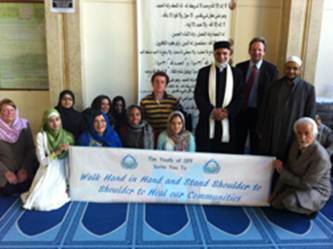 Tim Miller, Vice President of Universal Peace Federation – Europe, explained briefly about the work of the Community Cohesion working Group (CCWG). He emphasised the importance of various groups and communities working together. Through his experience in the Middle East Peace Initiative (MEPI) he found out how much we are inter-related, as he saw how political unrest in the Middle East does affect community strife at home. HRH Prince Frederick von Saxe-Lauenberg greeted all present and congratulated the group for its efforts to improve Community Cohesion in our neighbourhoods. 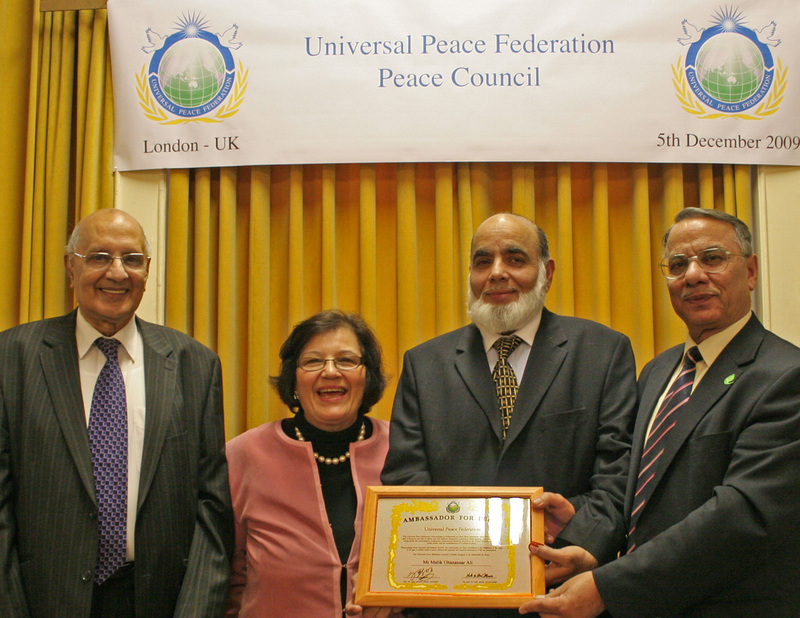 Many of the Universal Peace Federation (UPF) Community Cohesion Working Group (CCWG) members made their reports on the accomplishments of the year’s activities, working with the joint-chairs Saleha Jaffer and Cllr. Margaret Ali. 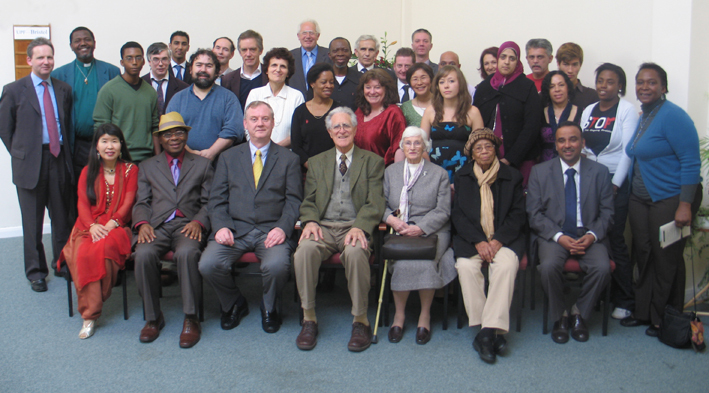 Among these CCWG members was also Former Mayor of Waltham Forest Cllr. Liaquat Ali, who said it was important to promote understanding by distributing information and knowledge about one another. He observed throughout the series of CCWG meetings how young and old, religious and civic leaders and community members including the Police were very interested in Community Cohesion. He said it takes all parties to work together to achieve the required result, he then added that he was proud to host the first UPF Community Cohesion event of this year. The former Speaker of Hackney Council Cllr. Faizullah Khan said we are here because we have a problem of not loving each other. He spoke passionately about the fact that we have lost the value of a caring society. Unless we bring the human aspect of loving our neighbour, Community Cohesion will not be possible. Saleha Jaffer emphasized a point made by Cllr. Khan and added that a community has to work together to educate our youth today. The former Lord Mayor of Birmingham Cllr. Mahmood Hussain is the first Muslim Lord Mayor in Birmingham’s history of 200 years or so. Although he was proud of this fact, there were many people who had been skeptical about the outcome of this appointment. He said Birmingham is an amazing city with a multi faith population of 1 million – the largest local authority in Europe. The former Lord Mayor said that what makes Birmingham a most amazing city is the fact that its people, mainly a population of immigrants, had chosen to stay in Birmingham because they simply loved the city! This makes a good recipe for Community Cohesion, because people are willing to break down barriers or at least they are not against doing so. Breaking down barriers is one job UPF does very well indeed so it will be a good thing to hold a Community Cohesion event in Birmingham. 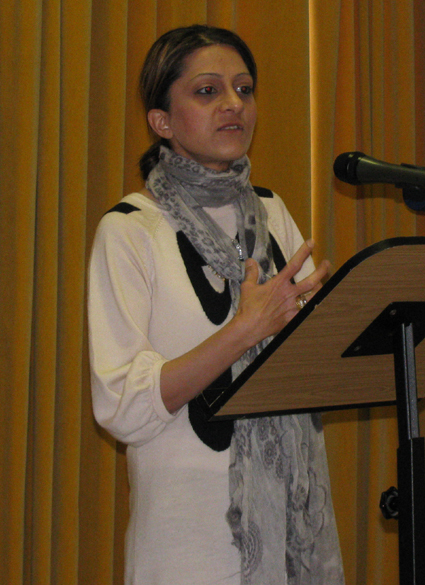 Ms. H. Bhattia explained about the existing community problems in Hastings, mainly due to the asylum seeker population. She also outlined ways to overcome these challenges. She expressed concern in terms of the rise of the British National Party candidates that are targeting Hastings. In developing Community Cohesion, Ms. Bhattia expressed that a greater effort should be made to include the Host community in the programs, so real cohesion can take place. 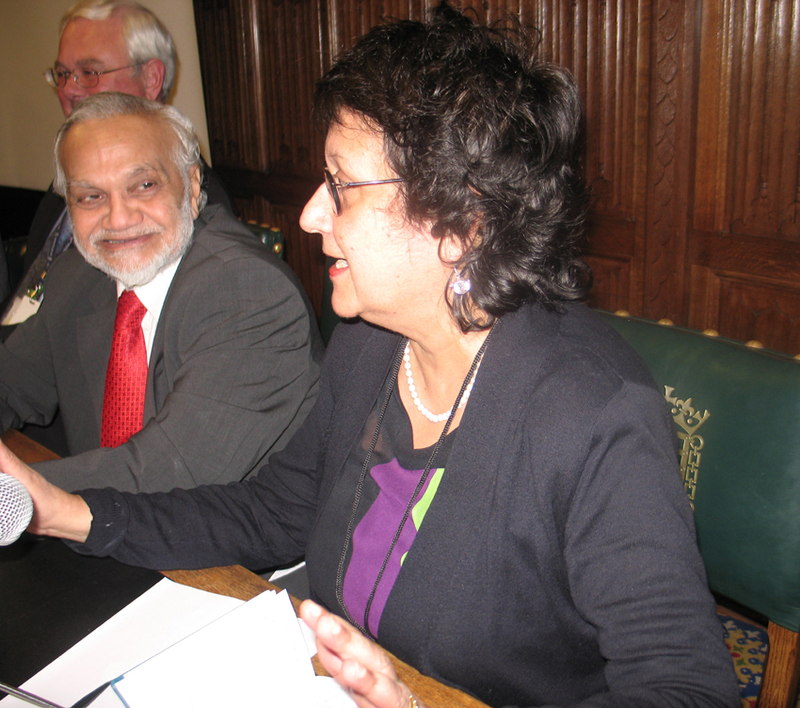 She also shared the positive news of the upcoming launch of the Hastings Interfaith Forum in October which will be followed by a Community Cohesion event in Hastings. Rev. D. Palmer explained passionately about the Community Cohesion event in Bristol. UPF- CCWG was invited to organize an event there. She said: “Representing all the councilors, NGO’s, youth and faith leaders, I can say that we had a most amazing start of this work in May. Everyone was appreciative of the UPF model of CC which is based on universal principles of peace building, emphasizing the importance of ’one family of mankind’. They carry on the good work and are planning to invite a group of youth from Bristol to come to CC event in September, to encourage greater give and take. 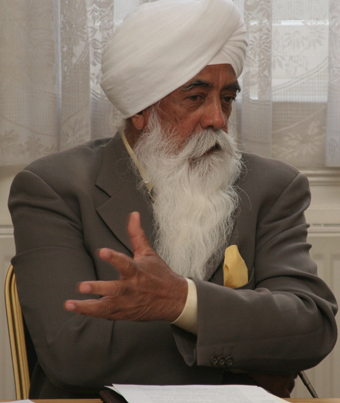 The respected Sikh leader from Birmingham Soho Road Guduwara, Bhai Sahib Ji, felt that the main role of faith leaders in building CC was to teach their followers, especially the young, to practice their faith in action. That will turn them into good citizens and responsible people – and if they could learn that all faiths teach these things, they will learn to respect and understand one another. He also suggested that faith leaders can assist local Government, Police and other departments, who often lack information that faith and community leaders can provide. A great interfaith giant Imam Dr Abduljallil Sajid, agreed with most of the sentiments expressed by Ba Ba Ji. He also added that through his vast experience in the interfaith world, he could see a lot of people of diverse backgrounds coming together. This togetherness is the first step in building community cohesion. The next step would then be WORKING together for a higher cause, as is encouraged by UPF. The Most Rev Father Dr Abiola emphasized the importance of faith leaders in taking care of their own people. They should teach them to share information about themselves with others and learn from others about themselves. In this way communities will not be shy or scared of one another and will avoid pockets of isolation, hence the communities will reach out to each other. This is our aim and this is what we can learn from this meeting. There were a few Police officers who gave us words of encouragement and offered us their services when needed. Inspector Melanie Roulston of Waltham Forest is working on a pilot scheme in CC work along with 2 Sergeants. At present there are five of these projects in the country. Carl Wonfor of the National Security Tension Team (ACPO) explained how important it is to have such gatherings of people. He talked about programmes that have borne fruit. He said we should all try to do things like this and develop our focus groups. Matthew Huish, UCL Interfaith Society Chair, talked about FAITHLINK, a youth organization that brings youth of all backgrounds together. They discuss topics of interest with students and thus get to know one another. 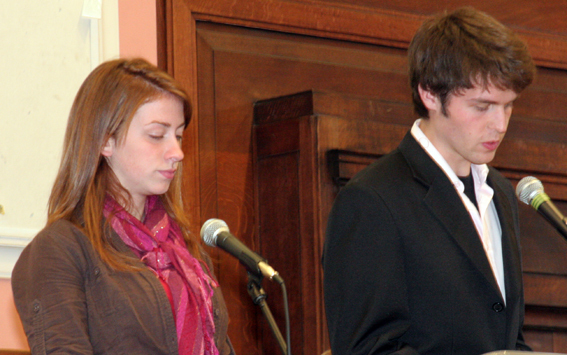 One exciting project they have: young people of different faiths go to Israel and Palestine. They participate in service projects and thus become acquainted with the situation in the Middle East. Most importantly they learn the points of view at both sides of the conflict. This is an ongoing project and so far they made four trips to the Middle East. They are also planning summer service projects in the UK. It is the best way for people to get to know one another, Mathew Huish said. Most exciting was to hear from a 16 year old called Liam Wilkinson, who was introduced to us by David Walker, a mentor training youth in Southwark. They both spoke about youth mediation programme that had successfully taught Liam and others resolve tensions. It was extremely exciting to hear from a 16 year old, speaking so candidly and with deep confidence about the value of the mediation work that he is doing. 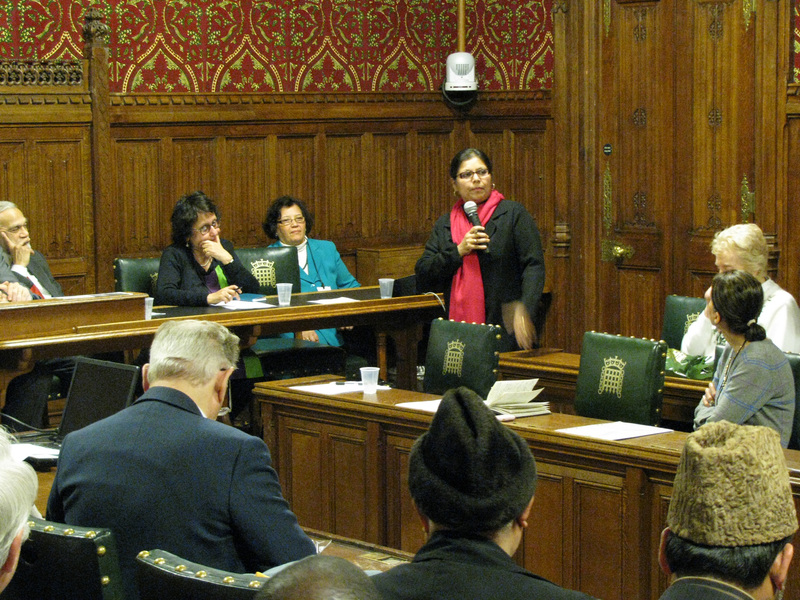 The evening was brought to a conclusion by Cllr Margaret Ali, joint chair of CCWG, emphasizing the point made by Saleha Jaffer, the other joint chair of CCWG, regarding how the group would like to help the policy makers and officers with the difficult task of keeping in touch with the people on the grass roots level. On a bank holiday weekend on a Sunday, Mayor of Waltham Forest, Mayor of Havering, speaker of London Borough of Hackney and most appropriately the civic ambassador of Newham gathered in Minhaj-Ul-Quran Mosque in Rumford Road, Forest Gate, Newham, to address a room full of over a hundred activists and professionals, Youth , and women regarding Community Cohesion projects in the region of East London area and to congratulate those in the audience who brought models of good practice from the community in specific areas of women, youth and civic/faith-leader groups. Mrs Saleha Jaffer and Cllr Margaret Ali joint chairs of Community Cohesion working group- welcomed all and invited The Civic Ambassador of Newham , Cllr Omana Gangadharan to give the opening speech. The speech was a wonderful testimony to her life coming to this point – she said that Newham is one of great Boroughs championing diversity and building community cohesion. Mayor Ali was very encouraged to see so many people here for this Community Cohesion Event. He was greatly honoured to host the first of the Community Cohesion events in Waltham Forest back in February, and is very pleased to be in this follow up event here in Newham and encourages a cohesive community as it is a happy community. Cllr. Faizullah Khan, Speaker of London Borough of Hackney, was very passionate about Community Cohesion and how Faith leaders and our Sacred Texts from all Faiths, just as much as Quran, can help so much in bringing better understanding and respect for the “other”. The incoming Civic Mayor of Newham, Cllr Akbar Chaudhary, praised the people and policies of Britain to make Britain one of the most tolerant countries in the world, he said we should all work together to keep it that way! There were Models of good practice presented by women, (from WFWP and Sabrang Ladies Friendship and Co-operation in South London) also sister Khadija from Minhaj Ul Quran shared about her work with women. 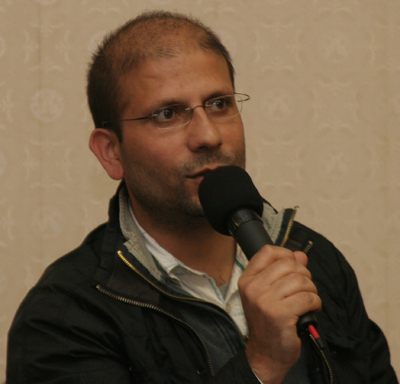 ,Youth work from Minhaj Ul Quran, was shared by Rafiq Patel who guides the youth work. and Youth from Service for Peace,(with Wait –East) and FAITHLINK, Faith connection for Youth- spoke of great models of good practice. Wait East had earlier in April in collaboration with London Wildlife Trust- done a great project in Dagenham involving youth of all races, backgrounds and faiths working alongside each other clearing the smaller trees to give way for larger trees to develop. Models from Faith Leaders, included speakers from Church of England and from the Catholic Church in Manor Park, Mr Patrick Hanley, who spoke of the great work they are doing in Muslim Christian dialogue forum, together with Imam Qureshi. The 2 Christian ministers were working closely in cultural and religious celebration projects with an Interfaith group in NEWHAM as well as with Minhaj Ul Quran particularly. The chief Imam of the Mosque spoke passionately about their work and expressed deep appreciation for spiritual aspect of the UPF presentation by Tim Miller. Imam Qureshi said “this is a fantastic event – all different people together makes good community -thanks for coming to our Mosque . 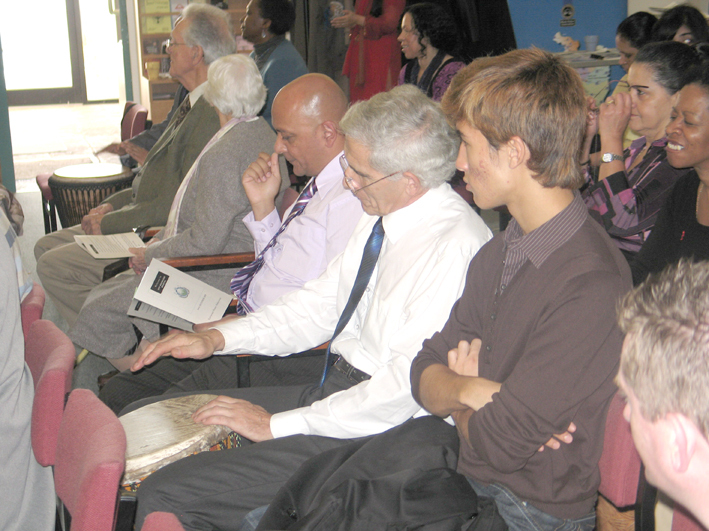 I enjoyed all the speeches, particularly Mr Miller’s speech, which had such a good spiritual input.. .”. We later had 3 concurrent workshop sessions 1. With women and women leaders 2. Youth and Youth leaders doing projects and 3. Faith and Civic leaders. All 3 groups had animated exchange of idea s and information sharing. We had reports from all three groups which were quite illuminating. People who did not have opportunities to share, were given a chance to speak briefly . The meeting was brought to a close with a good feeling of having sewn the seeds for good works to follow.